We take the time to review your business risks and recommend coverage to help protect you from the unexpected. Whether you need a strategy that will keep pace with the demanding changes of industry, or one to expand as your business grows, our agency will work with you to develop a customized insurance product. Replacement Cost Coverage is for destruction up to policy face value with no deduction for depreciation, substitution with other property of like kind and quality for property insured, which has been damaged or destroyed. Business Income Insurance will reimburse you for the net income your business would have earned if your business had not been shut down – or slowed down – due to covered damage to your property. Extra Expense Coverage covers necessary costs that you pay in order to get up and running more quickly. Blanket Coverage allows for a single limit of insurance to apply to two or more property items at one location or to two or more kinds of property at several locations, instead of a specific amount apply to a specific subject of insurance. Building Coverage provides protection for permanent structures listed in the policy. Business Personal Property Coverage protects personal property owned by your firm and used in your operations. The liability coverage of the commercial auto policy provides protection against legal liability arising out of the ownership, maintenance, or use of any insured automobile. The insuring agreement agrees to pay damages for bodily injury or property damage for which the insured is legally responsible due to an automobile accident resulting from the ownership, maintenance, or use of a covered auto. The insuring agreement also states that in addition to the payment of damages for which the insured is legally liable, the insurer also agrees to defend the insured for all legal defense cost. Garage Operations is defined as: The ownership, maintenance, or use of locations for garage business and the portion of the roads or other accesses that adjoin these locations. This type of coverage also includes all operations necessary or incidental to the garage business. The Contractors Equipment Coverage provides coverage for various types of equipment that a contractor may use at a jobsite. Tractors, cranes, graders, power shovels, forklifts, drills, front-end loaders, backhoes, bulldozers, draglines, concrete mixers, derricks, pile drivers, tools and similar equipment, both owned and non-owned or leased, can be covered under the policy. 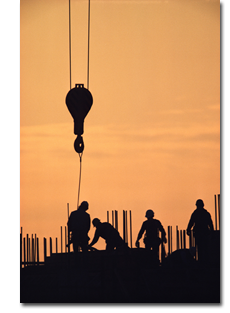 Builders Risk Coverage indemnifies for loss of or damage to a building under construction. Insurance is normally written for a specified amount on the building and applies only in the course of construction. Employee Theft Coverage is used to insure against loss of or damage to money, securities and other property resulting directly from theft committed by an employee, whether identified or not, acting alone or in collusion with other persons. Forgery or Alteration Coverage is used to insure against loss resulting directly from forgery or alteration of checks, drafts, promissory notes, or other similar written promises, orders or directions to pay a sum certain in money that are made or drawn by or drawn upon you; or made or drawn by one acting as your agent; or that are purported to have been so made or drawn. Theft or Money and Securities Coverage is used to insure against loss of money and securities inside the premises or banking premises resulting directly from theft, disappearance or destruction. Robbery or Safe Burglary of Other Property Coverage is used to insure against loss of or damage to tangible property other than money and securities inside the premises resulting directly from an actual or attempted robbery of a custodian, or inside the premises in a safe or vault resulting directly from an actual or attempted safe burglary. Robbery or Safe Burglary Outside The Premises Coverage is used to insure against loss of money and securities outside the premises in the care and custody of a messenger or an armored motor vehicle company resulting directly from theft, disappearance or destruction, and other property outside the premises in the care and custody of a messenger or an armored motor vehicle company resulting directly from an actual or attempted robbery. Funds Transfer Fraud Coverage is used to insure against loss of funds resulting directly from a fraudulent instruction directing a financial institution to transfer, pay or deliver funds from your transfer account. Money Orders and Counterfeit Paper Currency Coverage is used to insure against loss resulting directly from your having accepted in good faith, in exchange for merchandise, money or services. ERISA (Employee Retirement Income Security Act of 1974) is a comprehensive law covering many different aspects of employee benefit plans and is designed to protect the rights of pension and welfare plan participants. Umbrella Coverage provides excess liability coverage, over primary General Liability and Automobile Liability coverage. Excess Policy provides higher limits of coverage for those hazards covered by your primary policies. No coverage exists if not covered in your underlying policies. Self-Insured Retention represents the amount of damages and/or legal costs that you must assume before coverage under this policy becomes payable. Workers Compensation and Employers Liability apply to bodily injury by accident or bodily injury by disease, which includes resulting death. Deliberate Intention allows injured workers to sue their employers for damages in excess of those covered by the Fund. Federal Coal Mine Health and Safety Act Coverage Endorsement is used when the workers compensation policy is to coverage exposures subject to the Federal Coal Mine Health and Safety Act and applies to bodily injury by disease that is caused or aggravated by the conditions of the employment. Voluntary Compensation Coverage applies to bodily injury sustained by an employee, such as domestic or farm workers, who are not subject to the workers compensation laws. Experience Modification factors that are used to adjust the cost of Workers Compensation Insurance to reflect the actual loss experience of an individual employer. This coverage provides protection for directors and officers of firms or organizations against liability claims arising out of alleged errors in judgment, breaches of duty, and wrongful acts related to their organizational activities. This coverage is a type of professional liability insurance which indemnifies insured professionals—who include, but are not limited to, lawyers, insurance agents and brokers, accountants, real estate agents, appraisers, abstracters, title insurance agents, architects and engineers, advertising agents, adjusters, directors and trustees, fiduciaries, travel agents and data processing firms—for losses sustained because of their errors or oversights. This coverage provides protection for an employer against claims made by employees, former employees, or potential employees. Fidelity Bonds guarantee honesty of employees. These bonds cover losses arising from the employee dishonesty and indemnify the principal for losses caused by the dishonest actions of its employees. Public Officials Bonds guarantee a public official will act with honesty and/or faithful performance. These bonds are required by statutes and ordinances. These bonds guarantee the obligee that the principal will perform according to the terms of a written contract. Subdivision bonds are bond that are required of developers and/or property owners who are doing improvements to their property. These bonds generally are for the benefit of a municipal or state agency and safeguard the public against misrepresentation from the party required to provide the bond. A Boiler and Machinery policy can protect an insured against the effects of catastrophic property loss, such as steam boiler explosion or an expensive breakdown of machinery and equipment. This coverage is designed to provide coverage for flood damage to buildings and contents. Flood means either the overflow of inland or tidal waters or the unusual and rapid accumulation or runoff of surface waters from any source. A flood occurs when these waters invade land areas that are normally dry and inflict a condition—that is both general and temporary—of partial or complete inundation. When you have Business Income insurance, you will be reimbursed for the net income your business would have earned if your business had not been shut down – or slowed down – due to covered damage to your property. A farmer’s comprehensive personal liability insurance policy takes care of the special accident risks found around a farm. It protects the farmer against bodily injury or property damage claims from others. A farmowners-ranchowners policy (FO-RO) provides property and liability insurance. Any person or organization engaged in the business of transporting property by “auto” for hire. Liability Coverage agrees to pay damages for bodily injury or property damage for which the insured is legally responsible due to an auto accident resulting from the ownership, maintenance, or use of a covered auto. Medical Payments Coverage states that the insurer will pay all reasonable and necessary medical and funeral expenses incurred by an insured because of bodily injury caused by an accident. Uninsured Motorist Coverage pays for bodily injury to an insured who is injured by an uninsured motorist, a hit-and-run driver, or a driver whose insurer becomes insolvent. Underinsured Motorist Coverage applies only when the other driver has liability limits at the time of an accident, but the liability limits carried may be insufficient to pay the damages for which the driver is responsible. Collision Coverage provides protection against loss or damage to a covered auto or a nonowned auto resulting from the impact with another vehicle or object. Collision losses are paid regardless of fault. Comprehensive Coverage provides protection against loss or damage to a covered auto resulting from loss other than a collision or upset. This coverage also provides for supplemental payments for transportation expenses in the event of total theft of a covered auto or a nonowned auto-coverage begins forty-eight hours after the theft. Underground Storage Tank Coverage offers bodily injury and property damage liability coverage on a claims-made basis for insureds who become legally obligated to pay compensatory damages because of an underground storage tank incident.